Sophia Genetics acquires CDS software company. Genomics AI company Sophia Genetics has acquired Interactive Biosoftware, a maker of Alamut, a clinical decision support software for clinical genomic data interpretation. The terms of the deal were not disclosed. "We are very excited about the acquisition of Interactive Biosoftware," Jurgi Camblong, CEO and cofounder at Sophia Genetics, said in a statement. "Both Sophia AI and Alamut are technologies trusted by the healthcare community and focus on patient-centric innovation. The addition of Alamut marks a big step in our aim to help clinicians better diagnose patients equally. With a community of now over 900 teaching hospitals using our technologies we are in a unique position to connect clinicians and enable them to share knowledge." Garmin adds advanced sleep monitoring. Garmin has quietly added new sleep monitoring functions to a number of its smartwatches and activity trackers, specifically the vívoactive 3, Forerunner 645, Forerunner 935, vívosport, vívosmart 3, vívomove HR, vivoactive 3 Music, and Forerunner 645 Music. "In the past, Garmin devices only used movement and heart rate to analyze your sleep," the company wrote in a blog post. "With this update, if you have a compatible watch, we’re using additional data — such as heart rate variability — to better measure your time awake and time spent in each sleep stage." Chinese online pharmacy platform gets $66M. Yaoshibang, a Guangzhou, China-based online pharmacy trading and education platform, has raised $65.7 million (420 million yuan) in a Series C round led by Shunwei Capital and DCM Ventures, with additional participation by Green Pine Capital Partners, Elevation China Capital, and SIG. "Yaoshibang’s team has rich experience in pharmaceutical distribution. The firm is well respected in the industry. Shunwei is positive about its future growth," Cheng Tian, partner at Shunwei Capital, told China Money Network. Hackensack's new innovation center makes first investment: Drug-dispensing robot Pillo. New Jersey integrated care network Hackensack Meridian Health announced the first investment of the center's $25 million innovation program. Pillo Health makes a personal home robot designed to improve medication adherence. A desktop device with an animated face, Pillo can remind homebound patients to take pills, initiate telemedicine visits, and dispense pre-loaded doses. New telemedicine company uses blockchain for security, transparency. 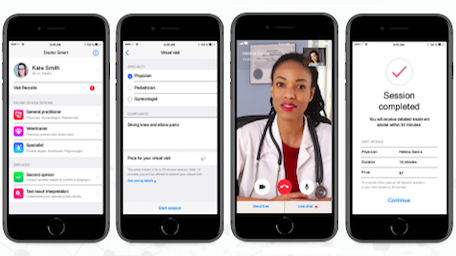 In Singapore, a new telemedicine app called Doctor Smart has launched. The company will offer video visits, voice calls, and chat and will use blockchain technology to protect patients' data.